We recognise that this is a complex and intergenerational issue for which there are no simple solutions. The issue does not affect all peoples of Aboriginal and Torres Strait Islander descent but rather a highly visible portion of Australia’s population, some of our neighbours. This is a sensitive area for all of us, when we are made to feel vulnerable in our own homes by the anti-social and disruptive behaviour of others and we rightly appeal to the authorities to protect our properties and our safety. But when that authority, in this case the Minster for Housing, Bill Marmion says that those who have been evicted “all made choices – bad choices”, it seems to be a case of potentially blaming the victim. The Department of Housing certainly does the best job it possibly can and works hard with families having problems, as the minster says they are not a welfare agency or social workers but are attempting to manage a difficult situation in a complex sector. However I am sure that we have all made bad choices in the past that have affected others, including our families, but most of us would not have been evicted from our homes for those choices. A lot of the families appealing for help from the service agencies have been affected by domestic violence or mental health issues. Some of them are Aboriginal women with children and grandchildren coping with cultural obligations to care for kin. In a comment reminiscent of the Stolen Generation, families are hiding from authorities out of fear of having their children taken away is they are evicted from their homes. Is it is a case of blaming these families because they want to maintain their cultural heritage? A key focus of the Closing the Gap strategy towards improving the health of Australia’s first peoples is the recognition that connection to culture is vital in “emotional, physical and spiritual wellbeing. [That] efforts to Close the Gap in Indigenous disadvantage must recognise and build on the strength of Indigenous cultures and identities” In this year’s Social Justice Statement “Lazarus at our Gates”, the Australian Bishops remind us that our government is a 2009 signatory to the UN Declaration on the Rights of Indigenous Peoples which includes a commitment to “work in genuine partnership with Indigenous peoples and ensure their fully informed consent before introducing policies and programs affecting their communities” One of the articles in the declaration includes the right of Indigenous peoples to be actively engaged in the development of programs that directly impact on their wellbeing, which includes appropriate housing. Mary McCormish asks if the accommodation that the Department of Housing provides is always appropriate for large, multigenerational Aboriginal families or if the tenancy support is not appropriate. The question must also be asked about the Department of Housings Disruptive Behaviour policy, if it truly recognises that connection to culture is vital and if there is a genuine commitment a partnership with Indigenous peoples prior to developing policies and programs that affect the community and how they live. 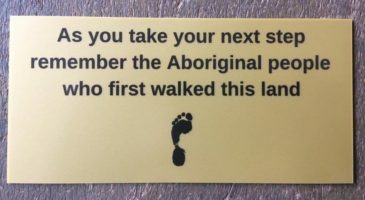 Professor Lyn Henderson-Yates in her 2009 address “The rush to Utopia: Australian priorities” describes the concrete path along which Aboriginal people walk each day of their lives. On one side is the cemetery, where so many Aboriginal people lie due to the overwhelming trauma of their lives. On the other side is the fence that represents western society, the concrete path is tightrope between cultural disadvantage and the dominant western culture. Professor Henderson-Yates asks of us all where do Aboriginal people belong? In the principle of solidarity, all Australians need to take a collective responsibility for the healing of the hearts and minds of the whole country, only in that way can we all thrive and flourish. The journey to reconciliation, involves justice, recognition and healing. It is about helping all Australians move forward with a better understanding. If we don’t the next “Stolen generation” we are apologising to might be the “Evicted generation”. Pope John Paul II (1986), Address to Aborigines and Torres Strait Islanders, Alice Springs, 29 November.